I want to preface this by saying that what will follow will sound like jackassery--and I don't intend it to. Yet the truth of the matter is that I get asked to read a lot of books. Asked by eager authors, publicists, friends of friends of writers, other booksellers, friends and random strangers. It's often quite difficult to decide what to read(I know, tough problem). My reading habits trend towards feast or famine. Meaning there are seven or eight things I want to read at one time or none at all. The logic--if there is any--behind what I choose to read and when is a very inexact science. In the past week two or three very perfect examples of this have taken place. 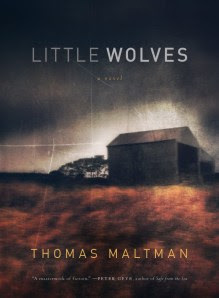 I started Thomas Maltman's "Little Wolves" several months ago. And by started I mean that I read the first two pages and decided it wasn't my thing. But the momentum kept building by word of mouth with other booksellers and writers. And I remembered hearing good things about his first novel. And Soho Press--a fine publisher of literary mystery and novels--published this one. So after much prodding I began it again this past weekend. And for the past three days its all I've wanted to do when I wasn't wrestling with my 2.5 and 5 year old boys. It has some wonderful MN angles but is equally good for people who know or care nothing about Minnesota. The second book is entitled "Here If You Need Me" by Kate Braestrup. I heard her a few weeks back on Krista Tippet's NPR program 'On Being.' I listened to a small portion of the program while sitting on the side of the road and was totally hooked. Her ideas on love and living and death seem both faith-based and no nonsense. I must confess to an aversion to organized religion as a k-college Catholic eduacation left me dizzied by the big C Catholic organization. Yet I felt at home with Braestrup's ideas on faith and loss. In both cases I listened to others and ignored my gut instinct. First thought=best thought might be the old wisdom regarding standardized tests but it has not proven to be the smartest idea in my personal life. Our reading paths are fragmented and non-linear. What we choose to pursue and continue on with is often only as important as what we choose to ignore. In these cases I feel lucky to have been guided to things I really enjoyed.